Attorney Bishop advises corporate clients in connection with a wide variety of commercial transactions, corporate formation, business and contract matters, mergers & acquisitions, lending and commercial finance and general corporate and regulatory compliance issues. He has represented domestic and multinational corporate clients across various industries including financial services, technology, manufacturing and consumer and industrial goods including software, electronics, automotive, specialty chemicals, pharmaceuticals, food & beverage, personal care, health care and home care. Prior to joining Cramer & Anderson, Attorney Bishop served as Senior Counsel for the Americas and Global Head of Ethics & Compliance at OpenLink Financial, a leading trading, treasury and risk management software solutions provider serving the energy, commodities and financial services industries with offices in Manhattan. At OpenLink, he provided legal counsel in connection with global licensing and other commercial transactions and oversaw the company’s global Ethics & Compliance program. Additionally, Attorney Bishop has practiced law in the Business & Finance Group at the New York offices of Morgan, Lewis & Bockius, where he counseled clients on domestic and international commercial transactions and mergers & acquisitions. He also practiced in the Corporate & Banking / Project Finance Group at the Washington, D.C., offices of Winston & Strawn, where he represented financial institutions, business enterprises, and government entities throughout the world in a variety of matters including project finance, lending and commercial finance, mergers & acquisitions, equipment leasing, software licensing and information technology. In addition to his private law practice experience, Attorney Bishop previously served as Chief Commercial Counsel for the Colgate-Palmolive Company, based in Manhattan, and also worked as a contract specialist at United Technologies Corporation’s corporate headquarters in Connecticut. 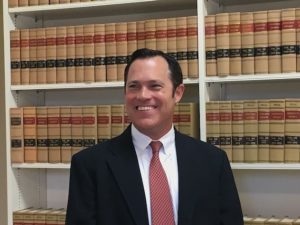 Having grown up playing hockey and baseball in Ridgefield, Attorney Bishop has been active coaching both Little League Baseball and travel youth hockey for many years. He served as a Member of the Board of Directors for the Ridgefield Amateur Hockey Association (RAHA) from 2016 – 2018 and was Co-President / Director of Hockey Operations during the 2017- 2018 season. Attorney Bishop’s father founded RAHA (formerly Ridgefield Youth Hockey Association), which has served the amateur youth ice hockey community in the greater Ridgefield area as a family-oriented program for over 40 years. Attorney Bishop attended Phillips Academy Andover, went on to receive a Bachelor of Arts degree from Colgate University, and earned his J.D. from Pepperdine University School of Law, where he was the Note and Comment Editor for the Pepperdine Law Review. He may be reached in the Ridgefield office, at 38C Grove Street, at (203) 403-4005, or by email at DBishop@crameranderson.com. 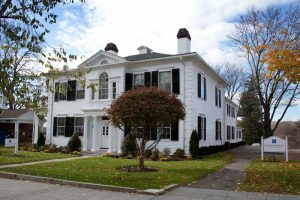 The firm’s flagship office is located in a historic structure on the Green in New Milford. Additional offices are located in Danbury, Litchfield, Kent, Washington Depot, and Ridgefield. For more information, see the website at crameranderson.com or call the New Milford office at (860) 355-2631.